It’s time for a post about my favourite subject and a picture of my favourite actor. 2 years and a bit on and the Girl has visited 65 people and there is still a queue (9, so it’s now 74 people) for more visits. Twenty three in total, I find it a mindboggling thought that this film has travelled this far, and that it doesn’t seem to stop travelling. I also find it astonishing that people are patient enough to wait, it takes months sometimes, until they hear the Girl crawling through their mailbox. In a time where internet, amazon and netflix supply us with films – the slow postal progress of the Girl around the world seems quirky and out of tune with the life we are living. Maybe the quirkiness is what attracts people to it. Or maybe people want to place their city on the map. Or they like Bill or Kelly, or the prospect of a great Richard Curtis movie. Some people write notes saying that they have seen the film a couple of times already, but that they want to be a part of this long chain of people who have participated anyway. I am happy to add anybody to the list! The message, of course, is much more important than any film can be: if you read at an average pace, 40 people have died of causes directly linked to extreme poverty since you started reading my post. That is what the film is about. I have nothing to add, that’s spot on. I really liked the movie. 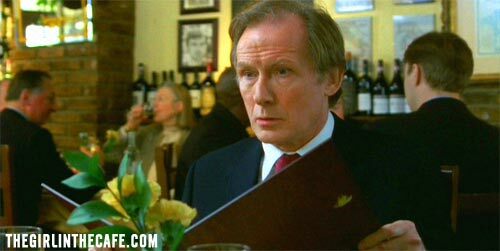 I liked the clumsy nervous Bill Nighy. To me, he makes it believable that this kind of things really can happen. On the other hand, to me there is too much “teaching” in the movie. Repeating all these facts over and over, I don’t know who has to be convinced. But any way, making a difference is what matters, and that message was very well passed. I appreciated to receive this movie and being part of a this circle. So what’s next, then. Well Finland and Austria are next, and Australia and the US and The Netherlands. And more destinations will hopefully follow. Bill thinks this is a pretty cool idea. I do too. Do you? Join here. It is free and it is, ehrm, quirky. I am from Romania and last night I saw the moovie on tv. I was very closed to go to sleep but the dialogue from the cafe-house makes me turn back in the living room and watch tv. It was a real pleasure to enjoy the film now after one week after the big summit from Bucharest.